Steinberg Media Technologies released Cubase 6.5, an update to its music production system. The virtual analog Retrologue and the granular Padshop synthesizers are two new VST instruments introduced in this update. Retrologue features two oscillators, each with a maximum of eight detunable voices, one sub and one noise oscillator, alongside 300 presets and sounds. Padshop features two individual layers in granular textures that are mixed and processed with a dozen high-quality filters, modulation and delay effects. Each layer consists of two LFOs, two ADSR envelopes and one oscillator together with new control parameters for generating up to eight grain-streams, plus 400 onboard presets for inspiration. New effects in Cubase 6.5 and Cubase Artist 6.5 are the DJ-EQ, a three-band EQ with frequency kill switches, and MorphFilter, a filter effect for blending between two of the low, high and band-pass filters. The latest highlights in VST Amp Rack are the new Maximizer and Limiter stompbox effects, plus 50 presets from bands the likes of Accept, Emperor and Meshuggah. Other enhancements have found their way into the 6.5 updates: optimizing the lane comping tool introduces the dedicated Comp tool with easy click-and-drag features as well as the Cleanup Lanes function for resolving overlapping events and the Create Tracks From Lanes function that converts lanes into audio tracks. The marriage between hitpoint and AudioWarp is designed to result in enhanced quantization capabilities, such as warp quantizing in the Quantize panel, warp markers from hitpoints and manageable, non-destructive quantization. More features new to Cubase and Cubase Artist are SoundCloud connectivity with its Upload Manager for dissemination of personal songs. Including the lossless FLAC audio compression codec saves up to 60% disk space when recording audio in real time. Third in line is ReWire 64-bit support and user interface localization in simplified Chinese. New synths: The new Padshop granular synth and the Retrologue virtual analog synth provide 700 presets. Sidekicks: Check out the DJ-EQ and MorphFilter effects and VST Amp Rack 1.5 with new stomp boxes and signature presets made by guitarists. 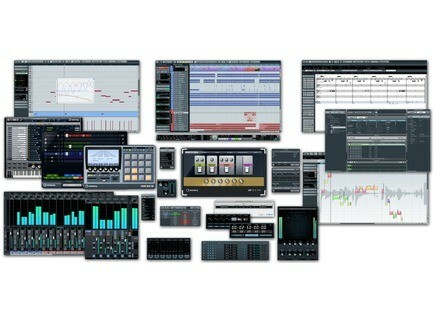 New comping and audio quantizing tools. Intercommunication: Export your mixes to SoundCloud, save up to 60% disk space while recording with the new FLAC support and connect ReWire client applications to Cubase in a 64-bit environment. Cubase 6.5 and Cubase Artist 6.5 are exclusively available as downloadable updates from Cubase 6 and Cubase Artist 6, respectively, through the Steinberg Online Shop for €49.99, including German VAT, and £42.34, including British VAT. Customers who have activated Cubase 6 and Cubase Artist 6.5 since January 1, 2012, are eligible for a free, downloadable Grace Period update to the latest version. The Cubase 6.5 and Cubase Artist 6.5 full retail versions are available from resellers and through the Steinberg Online Shop. The suggested retail price for Cubase 6.5 is €599, including German VAT, and £508, including British VAT. The suggested retail price for Cubase Artist 6.5 is €299, including German VAT, and £253, including British VAT. Crysonic Spectralive NXT V4 Released Crysonic released their fourth generation product Spectralive NXT V4 Spectral Audio Vitalizer / Enhancer. LinPlug Unveils CronoX 4 LinPlug has unveiled its first preview of CronoX 4 and updated the Mac versions of Alpha, Albino andCronoX.